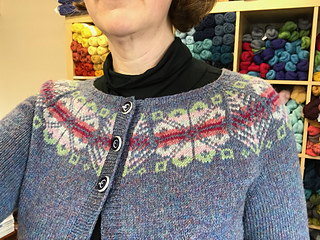 The wrong side of the Fair Isle patterning is beautiful too! 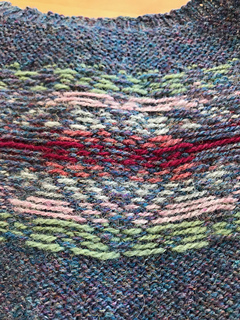 I worked a slip stitch crochet steek reinforcement before cutting open. 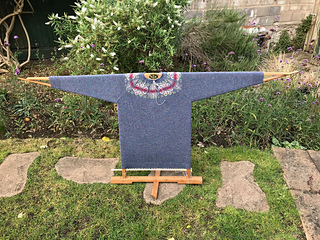 I blocked the uncut sweater on my jumper board before cutting the steek. 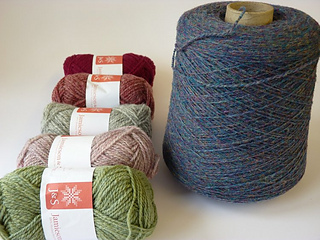 I have been lusting after a gorgeous Fair Isle yoke for a while. 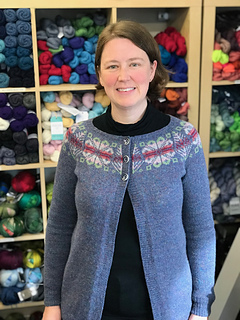 In Shetland we saw lots and lots of beautiful yokes of course, but the one that kept jumping out at me was Ella Gordon’s lovely Ola Yoke, so while we were doing the trunk show at J&S I cheekily enlisted Ella to help me to pick some colours so that I can knit my own! I’ve chosen the magical shade 366 mix for the main body colour. If you’re familiar with your J&S shades, you will know this is an incredible combination of turquoise, yellow, pink, purple and blues (it’s also comfortably in my blue-teal-turquoise palette that will match most of my wardrobe!). It’s a complex colour that should pick up the yoke shades really well. For the contrasts around the yoke we’ve gone for green (24 mix), pale pink (FC50 mix), that versatile grey (203), deeper pink (72 mix) and a solid deep pinky-purple 43. 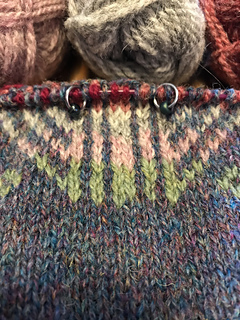 I’m thrilled with the combination, and am really keen to get knitting, particularly as I’ve reawakened my absolute love of Fair Isle. 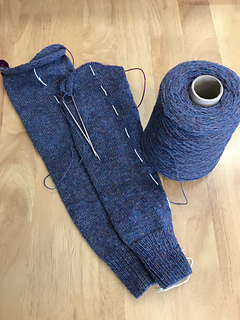 It will also be a great simple project to do when I’m tired or at knit night etc, since there will be plenty of stocking stitch before I get to the more interesting Fair Isle on the yoke. 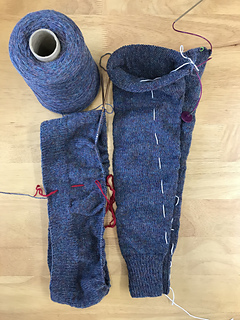 I’ve made a good start on the body, but it’s going to have to go on the back burner again for a while as I worked out it will take me about 5 weeks to complete the body, and really I need to get back to some work knitting now. When I cast on for the body I added 10 stitches. 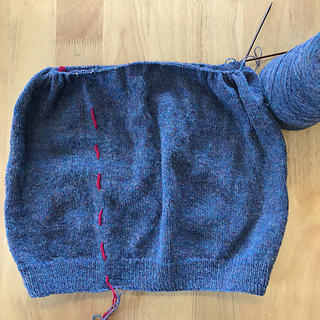 These are 9 stitches for a steek up the centre front, and an extra stitch so that the yoke pattern is symmetrical around the centre front neck. 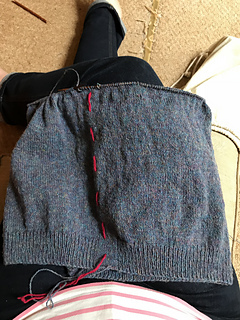 I will need to adjust the pattern instructions when I reach the yoke as my start of round will be in the centre of the front steek rather than at the back arm/body “seam”. I’m starting the colourwork! 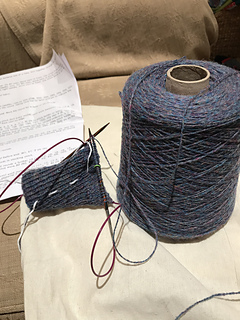 Starting on stitch 10 after my steek, and ending on stitch 10 too. Halfway through the colourwork and I am LOVING every stitch. So, so, so satisfying! 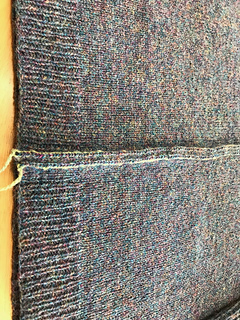 I picked up a stitch in every row down the fronts, taking a line from between the steek and body stitches. I then worked (k1, p1, k1, p2tog, k1, p2tog) up the first front (decreasing to the equivalent of 3 sts picked up in 4). I did the opposite on the second front (p1, k1, p1, k2tog, p1, k2tog). 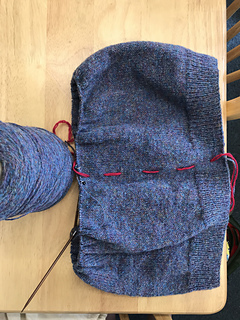 Knitted 9 rows in 1x1 rib then cast off in rib with larger needles.